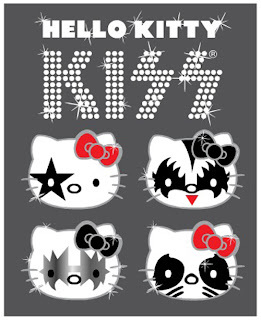 The KISS branding machine continues to work in overdrive as news surfaces that the band are teaming up with Hello Kitty for a new TV series. USA Today reports a program with the working title “Kiss Hello Kitty” is now in development, and it's based on the line of Kiss x Hello Kitty products which made its debut in 2010. The show will feature "four Kiss x Hello Kitty characters living their rock 'n' roll dreams and bringing pink anarchy to every situation they are in." KISS bassist Gene Simmons is slated to be one of the executive producers. "Knowing and viewing The Hub as I do daily with my three children, it is the perfect home for us to bring the Kiss Hello Kitty juggernaut to yet another generation,” says frontman Paul Stanley. KISS released an album called “Monster” last fall; they recently wrapped up an Australian tour and will begin a series of European dates starting June 1 in Stockholm, Sweden.